National Rifle Association Executive Vice President and CEO Wayne LaPierre speaks at the Conservative Political Action Conference at National Harbor, Md., Feb. 22, 2018. College campuses are ignoring the Constitution and spreading communist manifestos, said the National Rifle Association's Wayne LaPierre in an impassioned speech Thursday to a conservative group in Washington. "The U.S. Constitution is ignored" at U.S. universities, LaPierre, the NRA's chief operating officer, said to the Conservative Political Action Conference. "On college campuses, a communist manifesto is one of the most frequently assigned texts. … Karl Marx is the most assigned economist." Marxist theory espouses socialism and communism, and is opposed to capitalism, on which the American economy is based. LaPierre's fiery speech, which preceded a speech by Vice President Mike Pence, accused "Democrats, liberals, European socialists and intellectual elites" of using the mass shooting at a Florida high school where 17 were killed last week as a "shameful politicization of tragedy." 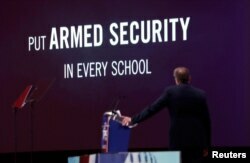 NRA Executive Vice President and CEO Wayne LaPierre watches an NRA promotional video while speaking at the Conservative Political Action Conference (CPAC) at National Harbor, Maryland, Feb. 22, 2018. Since that shooting, in which students and teachers were slain by a 19-year-old former student with a semiautomatic assault weapon, high school students have rallied across the country to find solutions to gun violence in the U.S. The U.S. leads the world in mass shootings and gun possession, according to sources including the Gun Violence Archive. LaPierre said the U.S. should "immediately harden our schools" and protect "open soft targets for anyone bent on mass murder." In a meeting later in the day, President Donald Trump backed up LaPierre and the NRA. "We have to harden our schools, not soften them," the president said. "I really think the NRA wants to do what's right. I mean, they're very close to me, I'm very close to them, they're very, very great people." But he dismissed the idea of having armed security officers filling the hallways of high schools. "You would have 100, 150 security guys," Trump said. "Who wants that many security guards standing all over the place, loaded up with guns? But you could have concealed [weapons] on the teachers, they wouldn't know the people, nobody would know who they are, and it is a tremendous threat." Those teachers would receive bonuses, the president said. On social media, teachers across the country responded with the hashtag #ArmMeWith to reply to those suggestions. "#ArmMeWith enough counselors and social workers to meet the social and emotional needs of all students," read one placard on the Teach and Shine page on Facebook. "ArmMeWith well-funded schools that allow for smaller class sizes and more resource experts," said another, pointing to limited school funding in many school districts across the U.S.
"OK. So the answer to regular mass murders at American schools is to arm the teachers," tweeted Michael Moran, observing from London with 27,000 followers. "But how are they going to pay for guns if they can't even afford pencils?"